Be part of the Gaydon Military Show and enter your vehicle for FREE! Now in its third year, the Gaydon Military Show on Sunday 30 September encompasses all aspects of military history with a range of activities for everyone to enjoy. The Museum is offering a FREE entry package for owners of military vehicles and displays who would like to be part of the show. The free entry package is for advance vehicle entries and includes a show pass and camping pitch for one driver and passenger. So come and be part of this great show at the British Motor Museum, on the grounds of former RAF Gaydon. Exhibitors and visitors alike are encouraged to dress up in their own military outfits and get into the swing of it with live music from popular singing trio 'My Favourite Things' performing classic wartime hits live, throughout the Show. The Warwickshire Army Cadet Force Corps of Drums will also be performing. There will be live 'running' demonstrations of a Merlin engine from a Spitfire and a Meteor engine from a tank. Visitors can find out about different wartime eras with exhibits from World War II through to the Cold War and enjoy impressive displays of military vehicles including armoured vehicles, jeeps, Land Rovers, soft-skinned vehicles and many more. The MoD Kineton Station will be providing a STEM tent with activities for children which include building cardboard helicopters, colour and cut out your own helicopter then launch and watch it fly, and K'nex rocket building. Inside the Museum there will be re-enactor displays from the Warwickshire Home Guard showcasing experiences from WW2, and the Royal Flying Corps Living History Group with period uniforms, medals and artefacts from WW1 through to the 1930s. Tom Caren, Show Organiser stated, "The Show is a real step back in time with a range of displays, activities and live music to keep everyone entertained. We would be delighted to hear from anyone interested in displaying their military vehicle or selling vintage fashion and militaria. There will also be the chance for visitors to make a weekend of it and camp in the grounds." 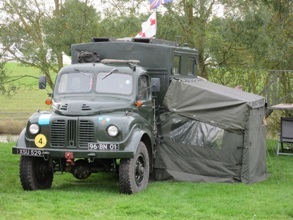 To be a part of the show and enter your military vehicle for FREE please visit http://www.britishmotormuseum.co.uk/events/gaydon-military-show where you can complete the online vehicle entry form. Interested traders should contact Show Organiser, Tom Caren on 01926 643358. For those wishing to visit the Gaydon Military Show normal Museum admission rates apply so you get the Show and the Museum for one cost. Adult tickets £14, Concessions £12 (including Service Personnel with valid ID card), Child £9 and Family Ticket £39. Children under 5 are free. Gift Aid annual passes are valid for this event. To find out more about the British Motor Museum visit http://www.britishmotormuseum.co.uk or call 01926 641188.